The FBI's claim that it needs Apple to access the iPhone belonging to San Bernardino shooter Syed Rizwan Farook is false, according to NSA whistleblower Edward Snowden. 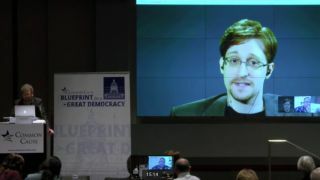 Discussing the FBI's assertion that Apple has "exclusive technical means" to unlock the iPhone, Snowden said "Respectfully, that's bullsh*t". Snowden elaborated later on Twitter linking to a piece by the American Civil Liberties Union explaining how the FBI could circumvent the iPhone's auto-erase feature without Cupertino's help. The article explains that the FBI just needs to copy the 'NAND' flash memory to ensure it doesn't wipe the file system key permanently. "All the FBI needs to do to avoid any irreversible auto erase is simple to copy that flash memory (which includes the Effaceable Storage) before it tries 10 passcode attempts. It can then re-try indefinitely, because it can restore the NAND flash memory from its backup copy." You can watch the video below (thanks, The Intercept).